SAN FRANCISCO, California, August 13, 2013 (ENS) – The Bay Area Bike Share pilot program will go live on August 29 with 700 bikes at 70 stations in five cities – San Francisco, Redwood City, Palo Alto, Mountain View and San Jose. 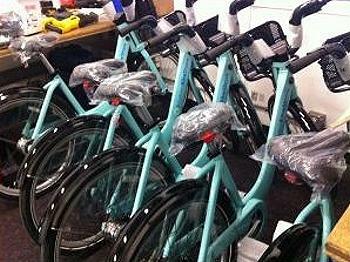 The first regional bike share system of its kind, the pilot is a part of the Metropolitan Transportation Commission’s Climate Initiatives Program that tests innovative projects for their ability to reduce greenhouse gas emissions from transportation. The program is managed by a partnership that includes the Commission, the Bay Area Air Quality Management District, and local government agencies – the City and County of San Francisco, SamTrans, Caltrain, the County of San Mateo, the City of Redwood City and the Santa Clara Valley Transportation Authority. Bike sharing can make it more convenient for Bay Area residents to take public transit, make short trips within the communities where the service is offered, and reduce air pollution throughout the Bay Area. In the Bay Area, the transportation sector accounts for more than 50 percent of overall air pollution. Emission reductions from the transportation sector will help the Bay Area attain and maintain state and national air quality standards and reduce greenhouse gases. The pilot will launch in two phases. The first phase will deploy on August 29 with 700 bikes. For the second phase, 300 additional bikes and 30 kiosks will be added in the first quarter 2014 to reach the full pilot complement of 1,000 bikes and 100 stations. The solar-powered electronic kiosk stations stocked with many bikes will be located near transit hubs, high-density residential areas and key destination points such as employment centers and universities, making it easier to quickly and conveniently connect to and from transit and to make short-distance trips by bike. Bike sharing lets people travel by train without bringing their own bike on board. It allows people to bike to places where they may not feel confident leaving their own bikes because of security issues. And people can bike just one way if they’re not comfortable biking in the rain. 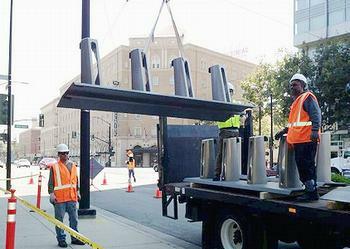 Bay Area Bike Share employees will be regularly circulating throughout the system to redistribute bikes and make sure there’s an appropriate balance of available bikes and docks at each station. Customers will be able to check real-time bike and dock availability online or on their smartphones at any time. If a customer wants to return a shared bike to a full station, the kiosk will direct her/him to a nearby station with available docks and 15 minutes of free time will be added to the trip. Customers will be able to call the Bay Area Bike Share customer service line 24 hours a day for assistance. Membership rates to join Bay Area Bike Share are $88 for an annual pass, $22 for a three-day pass and $9 for a daily pass. Each pass provides for unlimited trips during the membership period, with no additional cost for the first 30 minutes of each trip. Trips that exceed 30 minutes will incur surcharges. Annual memberships are available for sale online at: www.bayareabikeshare.com. Since memberships went on sale July 15, more than 500 people have joined. The cost of the full pilot program totals $11.2 million. It is funded using $7.1 million from the Congestion Mitigation and Air Quality Fund, $2.8 million from the Transportation Fund for Clean Air, and $1.3 million from other local funds.